The ATS642LSH is an optimized Hall effect sensing integrated circuit and magnet combination that provides a user-friendly solution for true zero-speed digital gear-tooth sensing in two-wire applications. 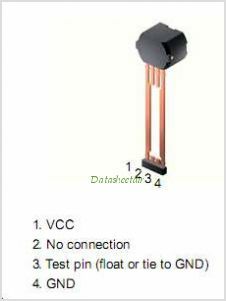 The Sensor consists of a single-shot molded plastic package that includes a samarium cobalt magnet, a pole piece, and a Hall effect IC that has been optimized to the magnetic circuit. This small package, with optimized two-wire leadframe, CAN be easily assembled and used in conjunction with a wide variety of gear shapes and sizes. The integrated circuit incorporates a dual element Hall Effect Sensor and signal processing that switches in response to differential magnetic signals created by ferrous gear teeth. The circuitry contains a sophisticated digital circuit to reduce magnet and system offsets, to calibrate the gain for air gap independent switchpoints, and to achieve true zero-speed operation. Signal optimization occurs at power-up through the combination of offset and gain adjust and is maintained throughout the operating time with the use of a running mode calibration. The running mode calibration allows immunity to environmental effects such as microoscillations of the target or sudden air gap changes. This is one package pinout of ATS642,If you need more pinouts please download ATS642's pdf datasheet. ATS642 circuits will be updated soon..., now you can download the pdf datasheet to check the circuits!